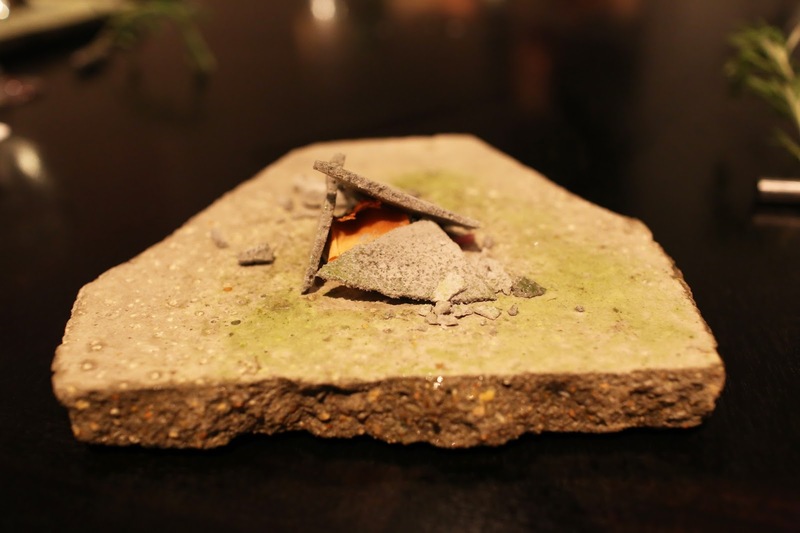 Alinea is one of the 12 restaurants in the United States that earned a 3-Michelin star rating. 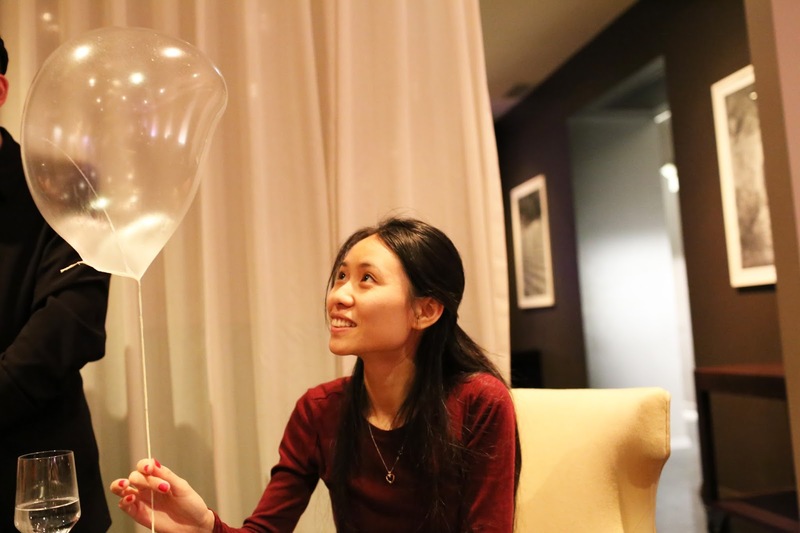 Their most memorable dishes are "the helium balloon" and "the hand-drawn dessert on the table". 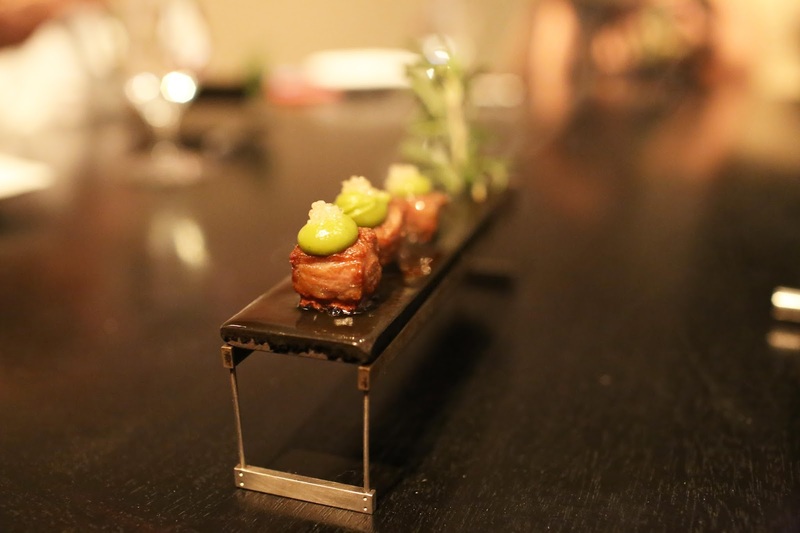 Similar to many other Michelin-starred restaurants, there is only drinks and pairing menu. The initial dinner is around $210-$295 per person. 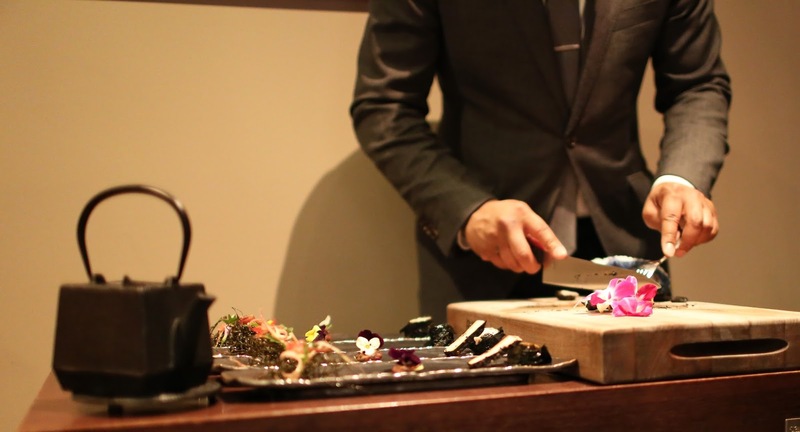 (not including pairings) There is a total of 25 courses, but I will emphasize mainly on the Japanese-inspired dishes. The restaurant is located at North Chicago, (we are in state Illinois!) about 15-25 minute ride from Downtown Chicago. The exterior of the restaurant barely has any window. Main entrance is fairly dark as well. Once you open the entry door, it leads to a short tunnel and you finally arrive inside this beautiful restaurant. It is not too quiet, people still talk and staffs are friendly and polite. First course is small sweet satsuma (a type of Asian orange) It is a re-make of the orange. Using the orange itself, it blends with saffron, star anise, and murray river salt. Then, re-create a small dessert that imitate a tiny orange. 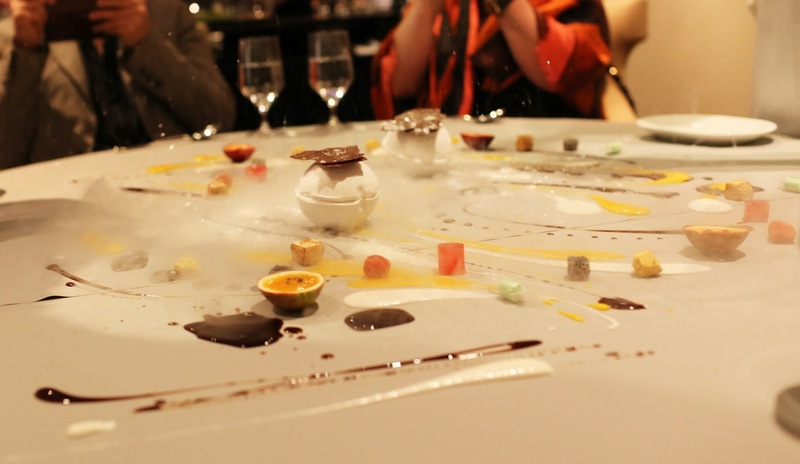 It is placed on top of dry ice, which champagne will pour on it later. It is only a size of a thumb (maybe a little bit larger) but you are supposed to put the orange into your mouth with lip closed, then bite onto it to fully enjoy the bursting flavor of satsuma orange. It was amazing and I always wonder how the chef can remake it into a small orange?! 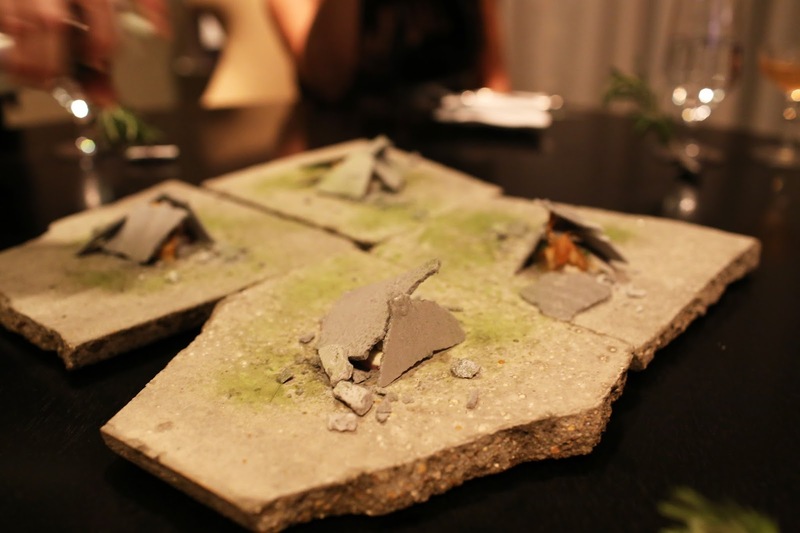 This dish below is called "Graffiti," and was served on a piece of stone. The gray pieces are like wafers, light and airy. Inside, there is matsutake (a type of Japanese pine mushroom) with sherry and parsley. On the same photo, there is a 3-layered cracker on the left, which is called "Tororo Kombu." (Sorry that I didn't get a clear photo of it!) Bottom layer is a crunchy dehydrated ice fish cracker, middle layer is Hamachi (Yellowtail fish) tartar, and top layer is Kombu seaweed. 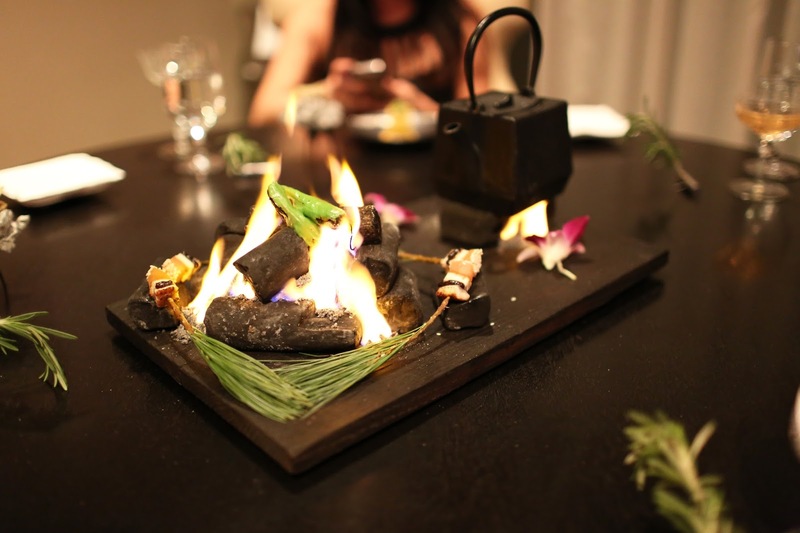 The next course is a warm, cozy campfire that link to multiple courses. 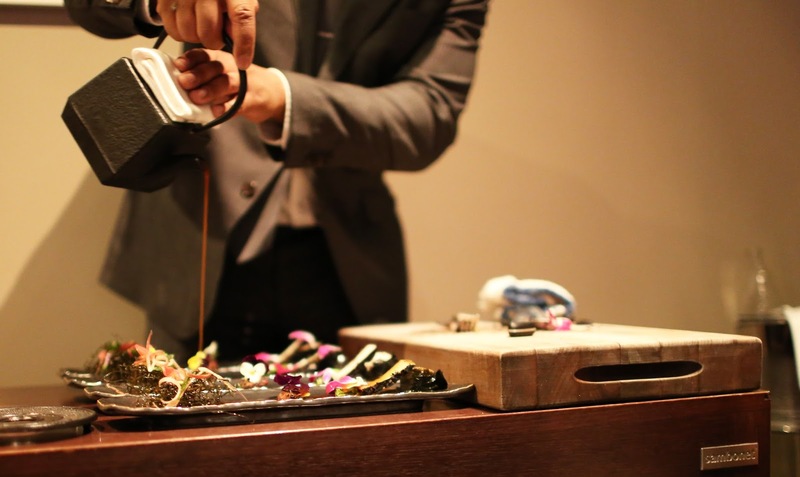 On the side, there is barbecued unagi (eel) skewered with a pine tree branch. (they are real.) The unagi is skewered with pickled plum (taste like very delicious pineapple!) and white sesame. It is glazed with brown sugar, orange, dark soy, black vinegar. Right above our table, there is actually a fishing string hanged from the ceiling. It is hooked with a shishito pepper this whole time! Server took the pepper down and put it right into the campfire for the next course. 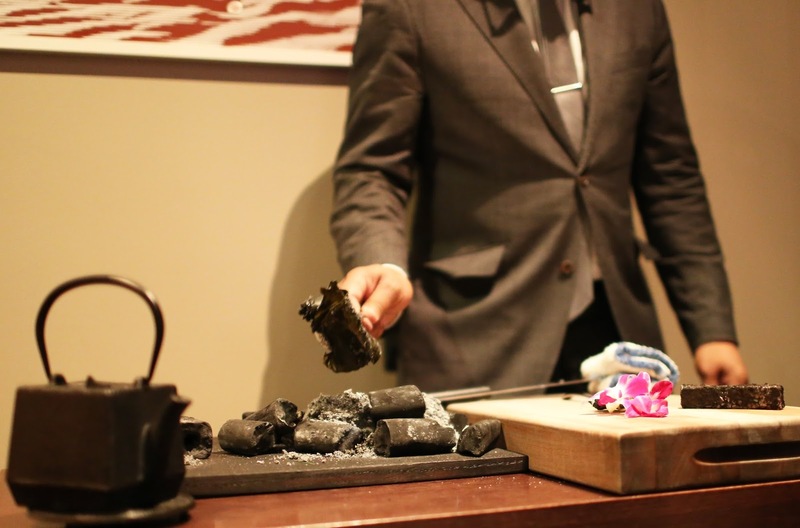 What's even more surprising is that one of the coals is edible! It's a foil wrapped chicken dish. And the black cube-shaped teapot at the back, it is also used for the next dish. Here, the staff picked up the "hidden" coal and unwrap it! Next, it is a sizzling Wagyu (Japanese beef) dish. It is served on a VERY HOT sizzling iron stand. There are 3 cubes of wagyu and timing of eating each is very crucial. Because the iron plate is still constantly slowly cooking the meat, each cube will taste slightly different because of cooking time. The later you eat, the meat can get over-cooked. This dish is seasoned with rosemary, topped with avocado puree, and caviar lime. Finally, it's chef's showtime. 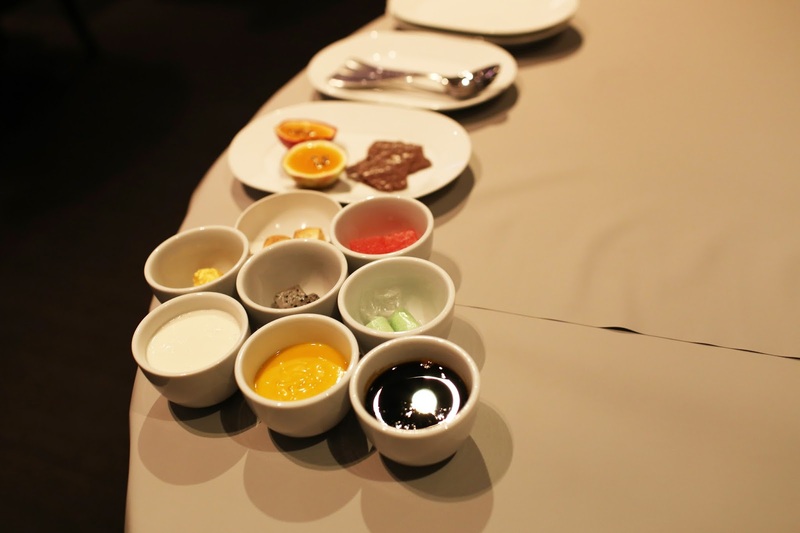 Main chefs prepared all the sauces and tropical fruits for tonight's dessert. 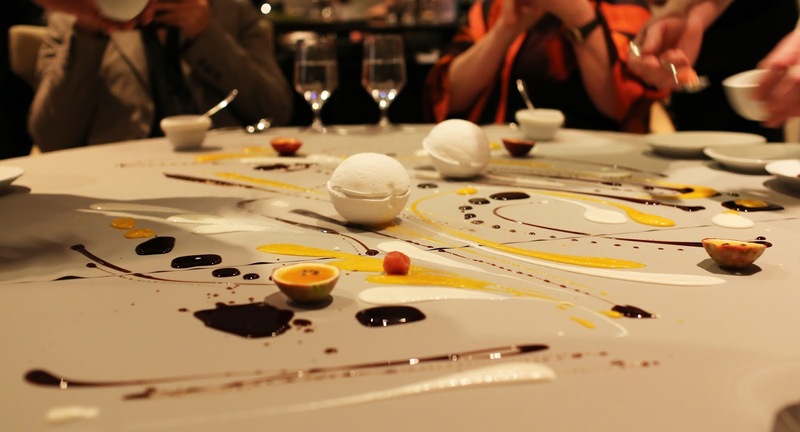 Beforehand, they place a special type of table cloth (it feels smooth and elastic like rubber) on the table. 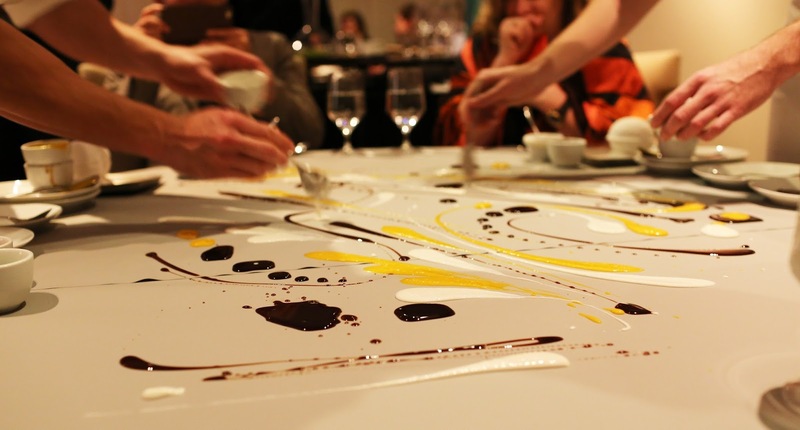 When the chefs start drawing on the table, it is like painting, except you can later eat the "painting!" There is a video of the entire process. Please watch it all the way below. In the beginning, chefs used dark rum and vanilla (black) Jamaican allspice (white) and mango (yellow) sauces to draw patterns and curvy lines. 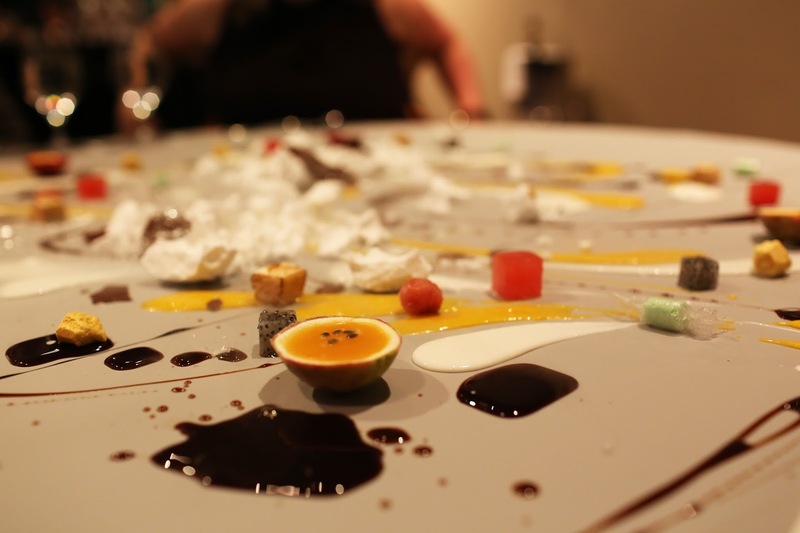 Then, they spattered cubes of dragon fruit, passion fruit, watermelon, caramelized banana, kaffir lime candies, etc. Two frozen coconut balls are placed in the center. 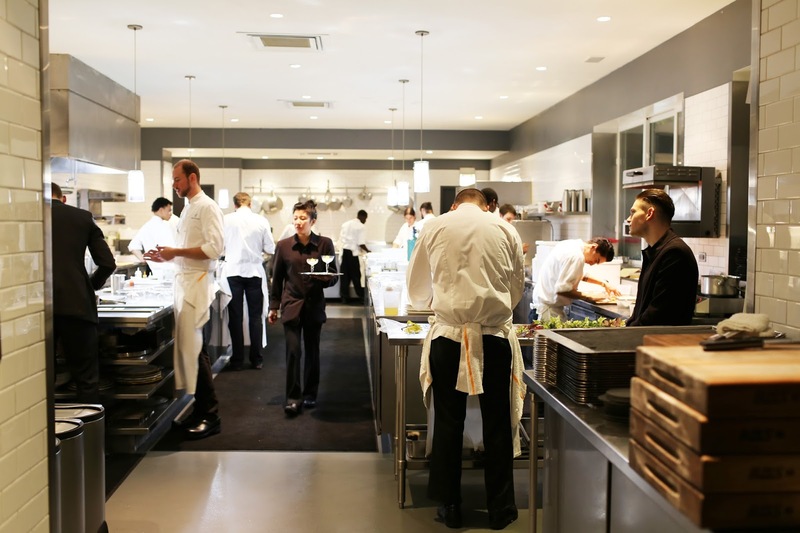 Alinea is one of the most well-known fine dining restaurant in Chicago. The reservation I made was around 2 months ahead. 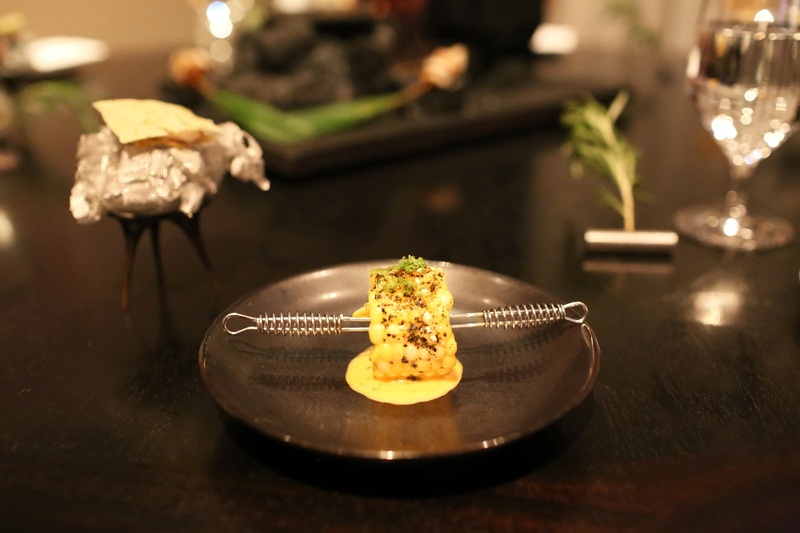 If you are looking for a fun fine dining experience, this is definitely one of the special places you shouldn't miss! Sauce art and edible balloons? Sign me up. Most of your US restaurant reviews are in California so for me here in the Midwest US, Chicago is not too far. Sounds immensely fun!